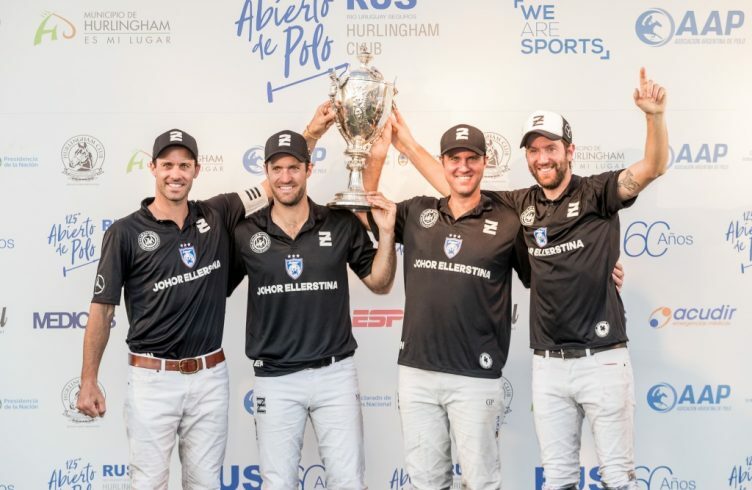 The 125 Hurlingham Club Open RUS came to an end on Saturday after the final that took place on Hurlingham’s number one ground between Ellerstina and La Dolfina. The title was won by Ellerstina for a third consecutive season, after they won the match 12-11. The club was packed with polo fans from around the world. Nico Pieres, who scored the decisive goal, played one of his best ever matches and was named MVP of the final. Ellerstina: Polito Pieres 10 (5 goals), Gonzalo Pieres 10, Nicolás Pieres 10 (3), Facundo Pieres 10 (4). Total: 40. La Dolfina: Adolfo Cambiaso 10 (5 goals), Pelon Stirling 10 (1), Pablo Mac Donough 10 (5), Juan Martín Nero 10. Total: 40. Umpires: Guillermo Villanueva and Gastón Lucero. Score Ellerstina: 1-2, 1-4, 3-5, 4-7, 6-7, 10-7, 11-9, 12-11. Open Guillermina (by Optimum and Open Geisha), played by Nicolás Pieres. Judged by: Ignacio Heguy/Francisco Elizalde. Fair Play Award: Juan Martín Nero. Top Scorer of the Tournament: Polito Pieres (31 goals). The Argentine Triple Crown continues with its final tournament: the Argentine Open, which kicks off on Saturday, November 10.